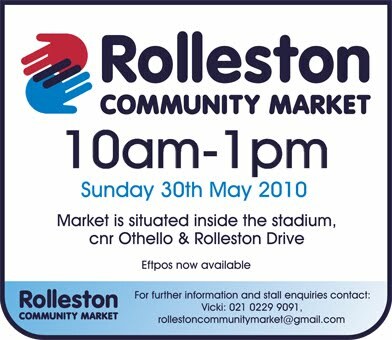 I will be at the Rolleston Community Market again this Sunday, so pop out and say hi! The market has moved indoors for the winter which is great news for stallholders and shoppers alike. Being able to browse through locally made handcrafts and produce whilst staying warm and dry is definitely a very big bonus right now! I will have some soy candles this time, so make sure to stop by and sample the gorgeous fragrances I have on offer. Having a market indoors is perfect given the wintry weather sweeping the countryside at the moment.. If I was in Christchurch I'd defintely venture out and pay your stall a visit. Thanks Denise. I did actually the sun shining through the windows onto the floor for a while. I didn't make millions, but it's always nice to go and be part of it.